Maiocco and Sweeney are each Bistro and MAC Award Winners, for Musical Direction and Outstanding Impersonation, respectively, and have jointly won the 2017 Bistro Award for Lee Squared in the category of Outstanding Musical Comedy Duo! Maiocco, a graduate of The Boston Conservatory, spent two decades in NYC as a Music Director, Off Broadway Conductor, and Broadway Orchestra Pianist prior to taking on the role of Liberace. 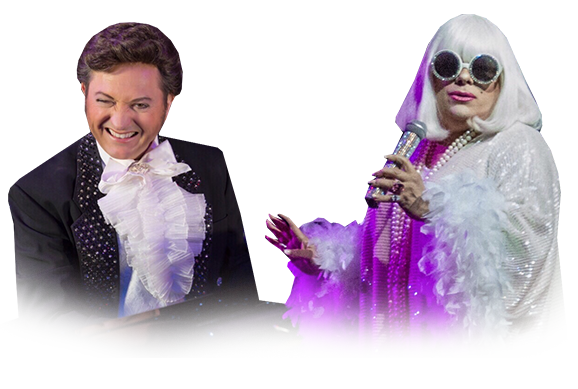 David is truly honored to perform as a licensed artist of The Liberace Foundation for the Performing and Visual Arts in professional theatres nationwide. Sweeney is a veteran musical theater artist who has performed solo shows–as himself or as Peggy Lee– in cabarets from Montreal to Miami Beach and points in between. An accomplished actor, he has also had roles in Off-Broadway and Off-Off Broadway productions and regional theaters . He keeps the memory of Miss Lee alive with a ‘fevered’ impersonation that includes a heavy dose of camp hilarity.